Lately, my days have been filled with reading journal articles, presentations, and essay writing. I have major deadlines coming up but I gladly welcomed a break away from the books tonight. 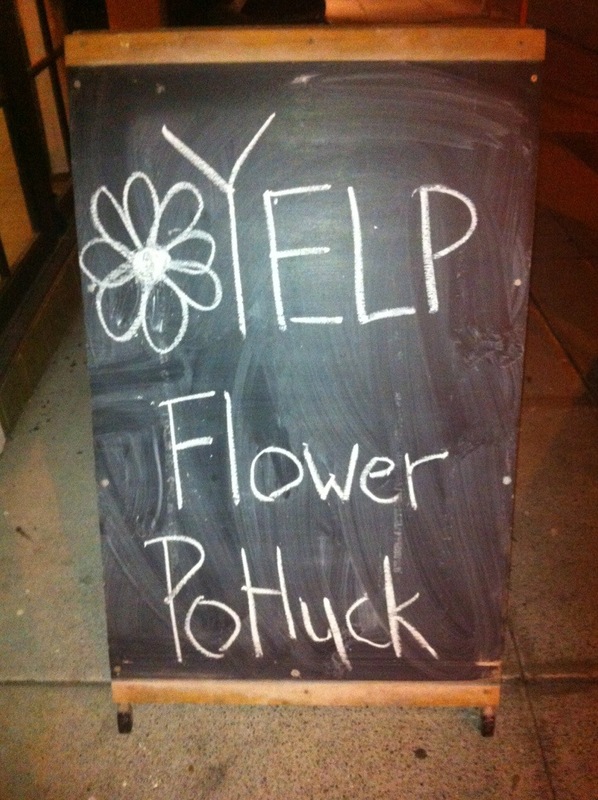 Yelp Brisbane invited me to their May Elite Flower Potluck and I happily obliged. Yelp Community Manager, Lani was inspired by Kinfolk Magazine who was hosting flower potlucks all around the world and she decided to host one right here in Brisbane! My gal pals and I headed to The Box in West End with hands full of flowers and foliage as our contribution. After checking in, we found ourselves walking into the most adorable courtyard welcoming us to paradise with fairy lights and painted wall murals. The tables had been set up with flowers in front of everyone’s seat with a cheat sheet for our upcoming flower arranging class! Lani welcomed us and gave us a rundown of what was going to happen and that she’d be visiting us from time to time with goat pies from the goat pie guy and hot chocolate from Bunker! I do not like chocolate but I have to say that you MUST run to Bunker and grab a cup or three. They make the best hot milk/dark chocolate you’ll taste in Brisbane. They are so friendly and I will be heading to Milton just to see them. 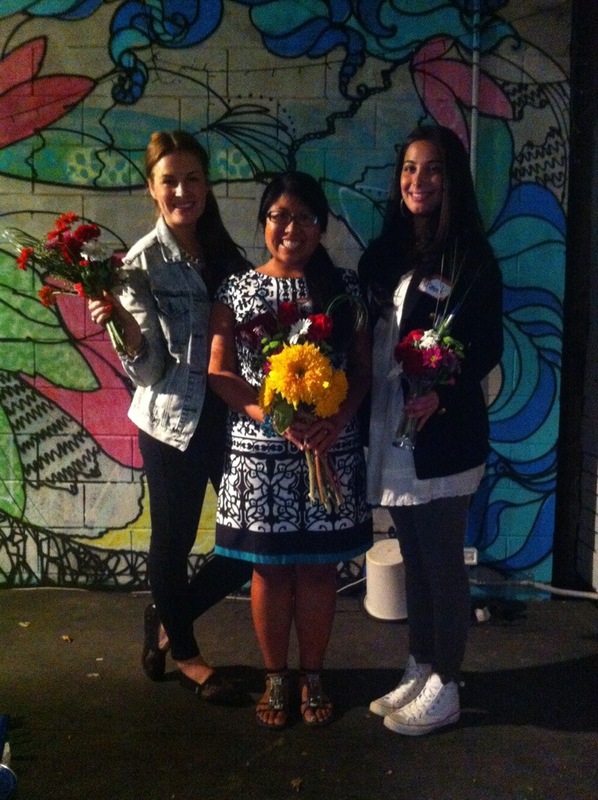 Then, Beck of Flowers in Hand took center stage and taught us the art of making beautiful bouquets! I am a big big fan of flowers as they make me really happy. If I could, I would have fresh flowers in my house every day! After showing us an example, she let our creative juices take over as we put deep red celosias (my new favorite), bright yellow sunflowers, crisp green chrysanthemums, white gerber daisies, purple irises, and pink carnations together. I got a bit carried away and after I was finished, I realized that my bouquet would NOT fit into the vase Lani had provided for each of us. Oops. 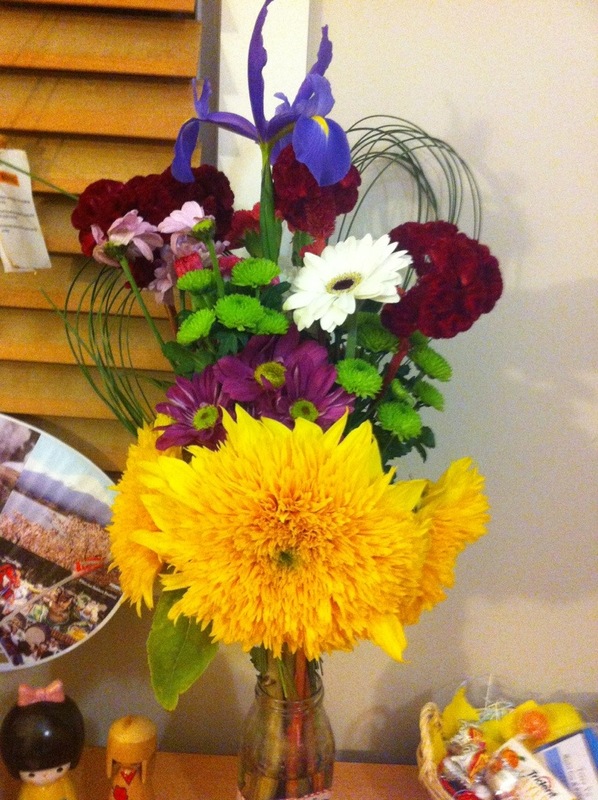 Not to fret, other people had extra flowers lying around so I made a much smaller bouquet to fit in the vase! I love symmetry and that was the focus of the vase bouquet. After finishing up our bouquets, Lani informed us that the flowers would be going home with us (YEAH!!!). We headed inside The Box for more goat pies, hot chocolates, and desserts from SOL Breads Organic Bakery. Mike of the goat pie guy was awesome and I fell for his Himalayan meat pie! Tender chunks of slow cooked goat meat in a rich Nepalese curry with ginger, tomatoes, and fragrant spices. YES, please. 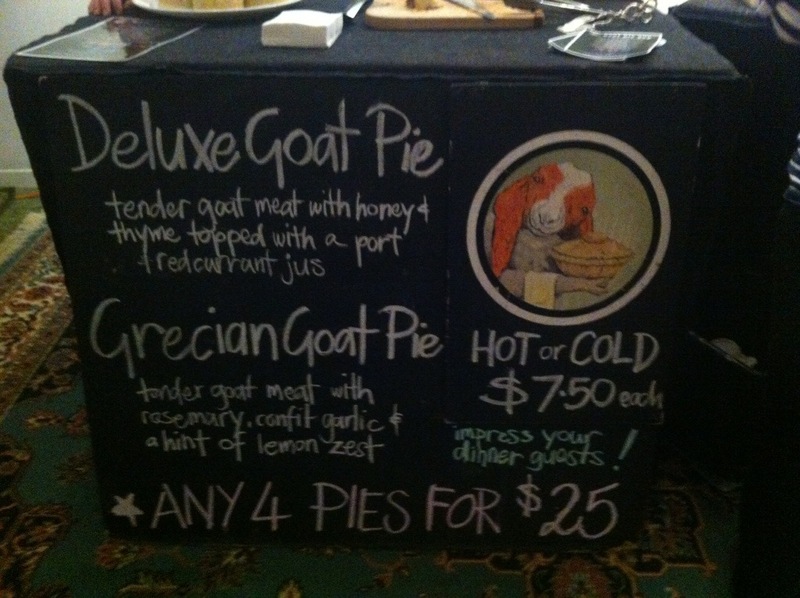 He also has a Moroccan and Malaysian goat pie that I am wanting to try. I told him how I love chili and he said that if I call ahead, he’ll make me a few special ones! I’ll be taking him up on the offer and will have to post about how the spiciness measures up. Goat Pie Guys Rocks. Try the Himalayan. We came with hands full of flowers and foliage and left with the most beautiful flower arrangements. As Jasmin and I were taking the bus home, I could see people’s faces light up when they saw our floral bouquets! Flowers seriously have a power and can lift spirits. Flowers make me so happy and I have found the perfect place for them, my desk, to cheer me up while I am studying! All good things must come to an end so I am signing off to get back to my books. Hope you enjoy the photos. Go and bring someone you care about (including yourself) a flower or bouquet today! I promise you’ll feel much better. Flower Power! Brightening up my desk and life!